Aggarwal, Dr. Reena is an Assistant Professor in National Institute of Fashion Technology, Mumbai. A master’s in textiles and clothing from Vanasthali University, She has done her doctorate in assessing the felting ability of different types of indigenous and exotic wool fibres from Vanasthali University in collaboration with Central sheep wool research Institute (CSWRI) Avikanagar. 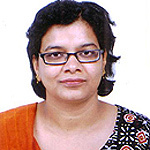 She has taught in Banasthali University, Delhi University and has a teaching experience of more than a decade. She writes for various journals and also presented papers at conferences. In addition to her interests in Traditional Indian Textiles and surface design techniques, she has worked extensively with natural dyes.